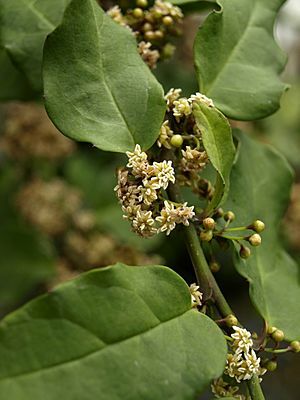 Amborella trichopoda is a small, evergreen, deciduous shrub. It occurs only in the moist, shaded understory of montane forests on the South Pacific island of New Caledonia. The genus is the only member of the family Amborellaceae and contains only this single species. 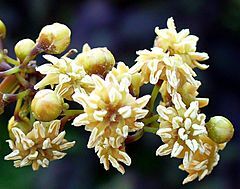 Amborella is of great interest to plant systematists because molecular phylogenetic analyses put it at or near the base of the flowering plant lineage. Since Amborella is apparently basal among the flowering plants, the features of early flowering plants can be inferred. This is done by comparing derived traits shared by other angiosperms but not present in Amborella. These traits are assumed to have evolved after the divergence of the Amborella lineage. The Amborellaceae are a line of flowering plants that diverged very early on (about 130 million years ago) from all the other living species of flowering plants. Among living flowering plants, it is the sister group to all other flowering plants. Amborella Facts for Kids. Kiddle Encyclopedia.